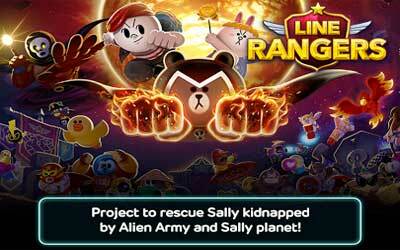 LINE Rangers APK 4.1.1 is one of popular games for android users. It is produced by LINE Corporation. This game tells you about LINE characters on the way to safe Sally who is being kidnapped by alien. If you are interested to play LINE Rangers, you should have LINE ID first. If you have not it yet, you can register it on LINE application. You don’t have to worry about your android storage as it just needs 48 MB. However, you should download many additional files to support this online game. The use of Wi-Fi connection is the best possible solution. At your very first time, you will find the tutorials and news about the kidnapping. Sally’s friends then try hard to liberate her from the alien whatever the risk. This is such an adventure game in which you must pass every level to continue to the next level. It is considered as easy game to play, moreover the tutorial will guide you. Do not skip the tutorial because you will be trained to attack, increase level, shoot the rocket, and many more. Different from other war game, the characters in this game can attack automatically. Therefore, you don’t have to control every movement. This game is full of merry as the characteristic of LINE. There will be cheering after finishing each level. This game needs internet connection to play. It works very smoothly even in the android with Jelly Bean operating system. How to get it? Make sure you have had LINE ID. Visit Google Play Store now and type in Line Rangers in the searching bar. Click on the LINE Rangers icon then touch on the apply part. Wait until the download process is completely finished then try to open it. Now, you can enjoy LINE Rangers for Android as your entertaining arcade game.